Function rooms and ballrooms (more than 12 options over four different floors) at Four Seasons feature warm neutral colors with plantation shutters, vaulted ceilings and high tech audiovisual equipment. Many of the function rooms feature floor-to-ceiling windows or even balconies. Reception Options: Catering is done on-site (indeed, Four Seasons provides catering for a few choice Las Vegas venues) and offers a kosher kitchen. 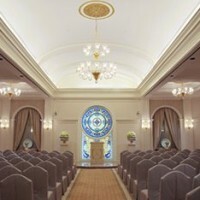 See real weddings at Four Seasons featured on Little Vegas Wedding. Dramatic for evenings, the Fountain Terrace is a lovely outdoor site backed by a picturesque waterfall and is surrounded by up-lit statues, seasonal flowers and lush greenery and trees. It’s available for both ceremonies and receptions. 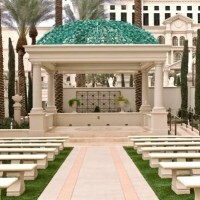 See real weddings at Four Seasons Fountain Terrace featured on Little Vegas Wedding. The pool at Four Seasons is a private, tropical setting showcasing the relaxed sophistication of the property. The striking Mandalay Bay tower acts as a dramatic golden backdrop. This venue is only available in the evenings. See real weddings at Four Seasons Pool featured on Little Vegas Wedding. The three chapels at Caesars Palace range in size in a Goldilocks-like manner. The mama bear being Classico with room for 196 guests, middle bear Tuscana featuring the decor of old world Tuscany hosting 80 and baby bear Romano just right for 35 with a Roman theme. Undoubtedly the enormous Classico is the showstopper here with a palette of of beige, light blue and cream, chandeliers, stained glass windows and a piano. In fact, it’s the largest hotel chapel on The Strip. Caesars Palace is a behemoth sprawling property, and even though I had been to the Augustus wing of the hotel many times (which is where the chapel lives) it can still be confusing to get there, so be sure to make sure your guests know where they are going. There is mixed information on having outside photographers and other vendors. It’s a $200 fee for outside florals, and photographers may incur a $400 fee: depending on who you talk to. I got two different answers from two different people, Caesars Palace chapel staff stating it was not possible, but also a photographer who shot there telling me the fee was $400. Reception Options: In-house receptions through the catering department are available for 20 guests and up. A number of restaurants on property are popular with couples for reception dinners including Serendipity 3, Restaurant Guy Savoy, Rao’s, Bradley Ogden, Mesa Grill and Bacchanal Buffet. In the attached Forum Shops restaurant options include: Cheesecake Factory, Joe’s Stonecrab, Spago, Max Brenner, Trevi and The Palm. Border Grill is set to open a second location sometime soon in the former PJ Clarke’s space. They already host receptions at their Mandalay Bay location, so this will be a good option. The Juno Garden is an elegant venue for an outdoor wedding boasting tropical landscaping, palm trees, lush foliage and classic Roman architecture, making it the perfect spot for a wedding you will never forget. 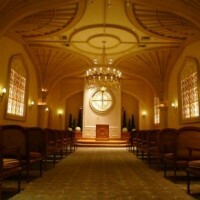 Features stone bench seating and a domed structure to exchange vows under. It is similar to, but does not feature as much water as the Venus Garden and is more secluded. There is mixed information on having outside photographers and other vendors. It’s a $200 fee for outside florals, and photographers may incur a $400 fee: depending on who you talk to. I got two different answers from two different people, Caesars Palace chapel staff stating it was not possible, but also a photographer who shot there telling me the fee was $400. See real weddings at Juno Garden featured on Little Vegas Wedding. Point Loma is a style ballroom-style space with floor-to-ceiling windows boasting a view of the famed Bellagio fountains and the heart of Las Vegas Boulevard. 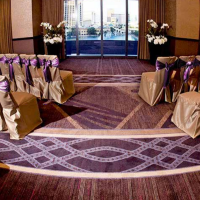 The space hosts both ceremonies and receptions and features a classy palette of taupes and purples. Reception Options: In-house catering for buffet and plated meals starts $105 per person. Bar packages start at $29 per person. 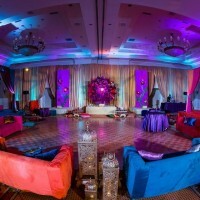 Receptions can be arranged in one of the ballrooms or a suite. There are 13 restaurants plus a buffet, as well. Groups over 13 must go through group dining for reservations. Over the years, Excalibur has softened the medieval theme, and the chapel is not as Renaissance fair’d out as you might think, m’lady. However, for those who do enjoy the middle ages, the wedding chapel works with a custom costume company and has a wide range of renaissance period themed outfits for men and women available for rent. Mixed reviews online about how they look, but with other costume rental companies in town, you have choices. Reception Options: In addition to ceremonies, the coordinators will also help you set up a reception on site through hotel catering, from $45 a person and up. There is a Bucca di Beppo just down the hall from the chapel as well, with great group rates. Directory listings appearing in this guide are for informational purposes only. Listings do not constitute an endorsement of the business, and Little Vegas Wedding is not responsible for any contracts signed or business conducted with venues listed in this free guide.